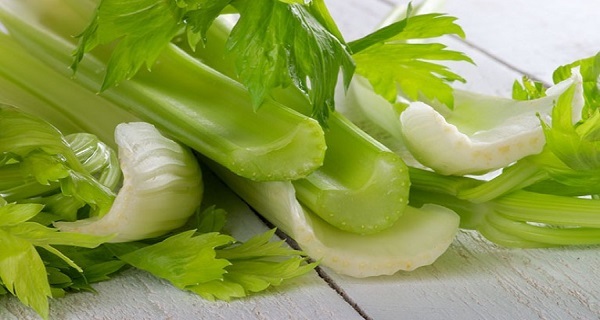 Home Unlabelled CELERY REDUCES HYPERTENSION, CLEANSES KIDNEYS, RELIEVES ARTHRITIS AND GOUT PAINS! Celery is from the same family with parsley and fennel, the Umbelliferae family. It can grow to the height of up to 16 inches. The ribs of celery are crunchy and are often used to make soup or salad. It has a salty taste, so celery juice is a good mix with the sweeter fruit juices. Depending on variety, some may taste very salty. Nutrients in the fiber are released during juicing, aiding bowel movements. The natural organic sodium (salt) in celery is very safe for consumption, in fact is essential for the body. Even individuals who are salt-sensitive can safely take the sodium in celery, unlike table salt (iodised sodium) which is harmful for those with high blood pressure. When combined with other juices, it provides different formula that help other conditions. Recent studies have shown that celery might also be effective in combating cancer. Blood Pressure: Celery has organic sodium that actually reduces blood pressure rather than increases it. Cancer: Celery is known to contain at least eight families of anti-cancer compounds. Constipation: The natural laxative effect of celery helps to relieve constipation. Cooling: During dry and hot weather, drink a glass of celery juice two or three times a day, between meals. Kidney function: Celery promotes healthy and normal kidney function by aiding elimination of toxins from the body. You can expect many more healing benefits from celery juice as you consume its natural sodium. Choose green celery where possible for its chlorophyll. Ensure that the ribs are still firm, not limp. To store in the fridge, keep celery in a sealed container or wrap in a plastic bag. Do not leave it at room temperature for too long as it tends to wilt quickly. If your celery has wilted, sprinkle it with a little water and put it in the refrigerator for a few hours. It will regain its crispness. Celery is such a succulent plant that it produces its own “pesticide” to protect itself from fungi. This protective layer is called psoralens which although protects the celery, may not go down so well with some people. Some people with low blood pressure had complained that celery makes their blood pressure even lower. so I believe it is also your overall make-up. But, you might want to avoid celery if you have low blood pressure. Listen to your body when you take celery. You can really help someone.